SANDERS Chocolates Candy Ice Cream Soda photo picture print photograph for sale. 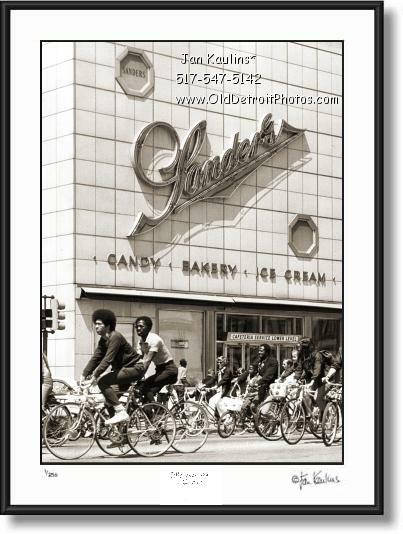 SANDERS Detroit Sign Detroit Ice Cream Chocolates photo picture print photograph for sale. This sepia toned Sander's Detroit Candy store, Bakery and Ice Cream photo print is made from an original black and white restored vintage Sander's on Woodward Avenue ca. 1960's in downtown Detroit photo. It shows the famous Detroit logo of this long time Detroit landmark on Woodward Ave. In the foreground is a group of people riding bicycles. The Sander's brand is a Detroit legend and has been so for many years. "The company was founded by German-born Frederick Sanders Schmidt on June 17, 1875, when he opened a candy store on Woodward Avenue at Gratiot in downtown Detroit. Schmidt, who went by his middle name, had originally opened his first shop in Chicago but relocated to Detroit after his store was destroyed in the Great Fire of 1871. Ice cream was soon added to the menu, then baked goods and sweet cream sodas. One popular story states that on one hot summer day, the store was packed with thirsty customers, and Sanders noticed that the sweet cream used for the sodas had gone sour. So he quickly substituted ice cream, and it became the talk of the town. Sanders is among those who claim to have invented the ice cream soda." THE ORIGINAL OLD DETROIT BLACK AND WHITE PHOTOGRAPHS HAVE DIGITALLY BEEN RE-MASTERED AND ALL MAJOR FLAWS, SUCH AS TEARS, SRACTCHES, MISSING PIECES, FOLDS, INK STAINS ETC. ON THESE RARE PHOTOS HAVE BEEN PAINSTAKINGLY REMOVED AND CORRECTED AND HIGH QUALITY PRINTS OF THESE HISTORIC RARE DETROIT BLACK AND WHITE SEPIA TONED PHOTOS ARE NOW OFFERED, FOR THE FIRST TIME, ON THIS WEBSITE WWW.OldDetroitPhotos.COM . THESE PHOTOS HAVE BEEN BEAUTIFUL RESTORED AND ARTISTICALLY SEPIA TONED AND OFFERED IN A LIMITED EDITION OF INDIVIDUALLY PRINTED PHOTO PRINTS. THEY ARE READY FOR DISPLAY IN YOUR HOME OR OFFICE. HERE IS YOUR CHANCE TO OBTAIN AND ENJOY SOME VERY SPECIAL AND UNIQUE DETROIT HISTORY.